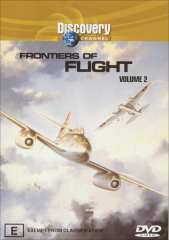 Well here we are into the second chapter of the series that is Frontiers of flight Volume 2. We have already seen mans first attempt at heavier than air flying machines, through the first endeavours of powered flight and here we find ourselves propelled through time into the age of jet and rocket powered flight. This is truly a remarkable panorama of how man has realised the potential for air�bound accomplishments. Just to take you through the many parts of this DVD package which is a very involved and sweepingly thorough journey acquainted with the pioneers of flight. Chapter 1 �Air Transport for all� seats us down on the wing tip to view the start of passenger carrying aviation. Propeller driven aeroplanes become safer, faster and more controllable and the industry made up of a very few talented aviators tries to gradually herd out the public�s misconceptions about the dangers of flight. Chapter 2 �Golden Age Frontiers� explores the quick advancements in technology that aviation takes. Highlights for this chapter include when we see Amelia Earhart be the first woman to fly solo over the Atlantic. Wiley Post broke many records in his plane the Winnie Mare including high altitude and around the world speed records. The latest plane in the early 1920�s the Nr2100 was developed and broke the land air speed record at 294 miles per hour. Jimmy Dolittle flies in a plane with a twisted slab propeller, which the engineers are worried might break mid flight. This leads to an outcome I will leave you to find out. There is an around the world race featuring all kinds of aircraft coming together to compete. If there was a most curious prize for this chapter it would go to Roscoe Turner who flew in a 1000+ horsepower plane accompanied by his pet mascot Lion. He was a strange man in the way he made himself kernel and had a fitting moustache. To his credit though, he was a good speechmaker and aroused much public interest. This chapter is very slow but would be very informative for those with an interest in history and aviation. Chapter 3 �Rocket power� is about a man called Richard Hutchings Goddard who assembled the first fuel powered rocket. Richard was first inspired to do this while reading War of the worlds as a child. We are then taken through the first few steps of this groundbreaking technology, which was to take man to the moon. Richard had many failed attempts, which contributed, to his notoriety as the �moon rocket man� in the local town. This chapter is painstakingly boring after a while and was not the glowing innovation of this dvd. There was not enough motion capture and too many interviews with non-inspiring volunteers. A lot is also made up of panning static pictures with a narrator speaking over the top. It is a wonder how they made such an exciting subject so tediously dull. Chapter 4 �Jet Power� succeeds in many areas to become one of the most interesting watch in the series thus far. There is more interesting content overall and is a commendable effort by the makers of this series. Jet power was in development in the late 1930�s and was pioneered by many people across the world. Countries include U.S.A (of course), Germany and Britain. When seeing the jets in the U.S.A it is amusing to see what lengths they went to, to make sure their latest invention stayed concealed from the public eye. Jet engines take performance of air travel into the stratosphere. This chapter discusses the many advantages of jet powered flight over propeller based engines. This is just a sample of the very involved and intense product that is Frontiers of Flight Vol 2. Other than the third chapter on Rockets there is a lot to recommend. The attention to detail and attempts to make an educational but entertaining program is almost pulled off with passable effect. This program comes highly recommended to those keen on air travel or studying history.